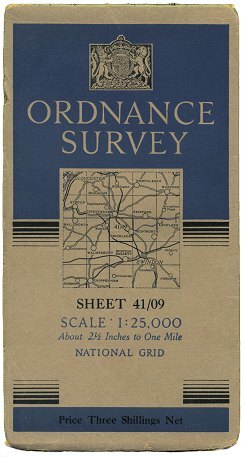 1:25 000 mapping had been used by the military since the First World War, and one of the recommendations of the Davidson Committee (see 1-inch Fifth Edition) was that a national series of 1:25 000 maps should be published in a civilian edition, mainly to fill a gap in the market between 1-inch to the mile (1:63 360) and 6-inches to the mile (1:10 560) mapping. 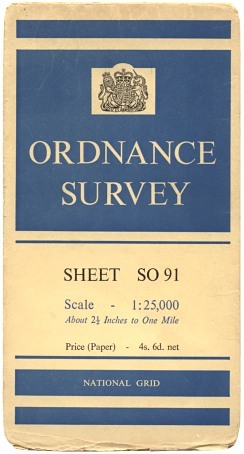 The 1:25 000 Provisional Edition, as it was referred to, was created by tracing reduced copies of the six-inch surveys of up to 20-odd years previously, and incorporating important revisions. The intention was for the ‘Provisional Edition’ to be a temporary measure, until the large scale re-survey of the country was ready to be incorporated into published maps. It was then intended that, as each area was re-surveyed, the 1:25 000 maps would be fully revised and designated 1:25 000 ‘Regular Edition’. As planned out, most sheets covered an area of 10km × 10km (some sheets were extended by up to 5km, on the coasts), and were numbered according to their position on the National Grid. The first Provisional Edition sheet to be published was sheet 40/09, covering part of Bournemouth and Poole, in November 1945. Each sheet was issued in a top-folding buff-coloured card cover (Figure 1). After c.1949/50, the cover design was printed on a lighter-coloured card (Figure 2). In 1955, a less ornate cover design was introduced (Figure 3). This was updated a year or so later to incorporate the coat of arms of Queen Elizabeth II (Figure 4). In practice, the glaring outdatedness of the maps, the small coverage area of each sheet and the rigid grid-based sheet lines meant that the public reaction to the new series was decidedly mixed. Sales were slow to pick up, and the discontinuation of the series was seriously considered on more than one occasion. As time drew on, the poor reaction the 1:25 000 map made meant that wholesale revision to ‘Regular Edition’ specification seemed less and less practical. Ordnance Survey faced some tough choices on the 1:25 000. Reluctantly 11 ‘Regular Edition’ sheets, covering an area round Plymouth, were published in July 1956 to test the water. By November 1956, all 2,027 intended Provisional Edition sheets had been published. Most of the Highlands and Islands of Scotland were omitted, with the intention of using the re-survey material to publish the 605 missing sheets directly in ‘Regular Edition’ style. Despite the measured success of the 11 published ‘Regular Edition’ sheets, the rumblings of discontent were growing louder. 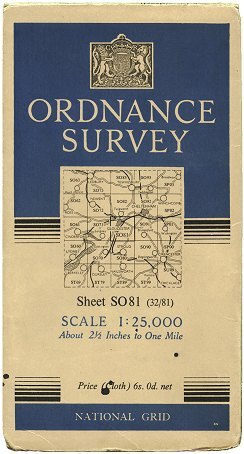 Ramblers’ groups in particular felt that a larger sheet size would be beneficial - walks often seemed to span two or more sheets of the 1:25 000 map. After much discussion and debate, a new sheet layout and series format was drawn up for the 1:25 000 map: each sheet would be 20km × 15km, covering Great Britain in 977 sheets consecutively numbered from north to south. 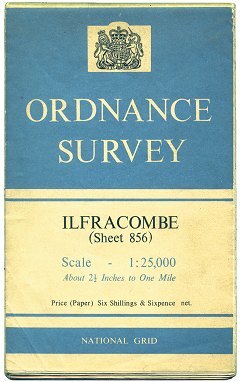 At least four sheets in the new layout were prepared, but only one - Sheet 856, covering Ilfracombe & Lundy - was put on sale, in 1960 (Figure 5a). 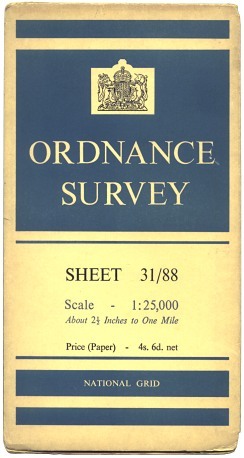 The sheet size and layout of the proposed new series was the subject of many complaints, including from teachers who felt the original 10km × 10km size was ideal for school desks. Ordnance Survey was forced to rethink the 1:25 000 yet again. 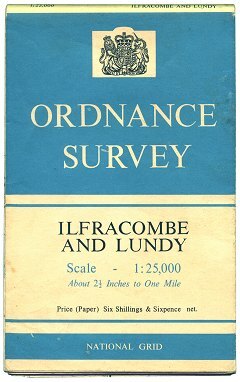 In the face of growing complaints on all aspects of the published 1:25 000 sheets, it was decided in early 1962 to concentrate efforts on a completely new national 1:25 000 series: the 1:25 000 Second Series, drawn afresh using the latest material from the large scale re-survey of the country. ‘Sheet 856’ was reprinted without revision, and omitting its number, in 1964 (Figure 5b). It remained on sale until its replacement in the 1:25 000 Second Series was published in July 1968. With the plan for the future of 1:25 000 mapping decided, revision of the Provisional and Regular Edition sheets continued. In 1965 a new cover design was introduced, which is unmistakably of the era, referred to now as the ‘magnifying-glass’ cover (Figure 6). This cover had two variants: one with an England & Wales corner-piece (Figure 7a), and one with a Scotland corner-piece (Figure 7b). After December 1965, when the first Second Series sheets were published, the Provisional and Regular Edition sheets were kept - grudingly - in print, with only very minimal revision, until their replacements were ready. By 1970, publication of the 1:25 000 Second Series was beginning to gather pace, and the 1:25 000 Provisional and Regular Edition were re-named the ‘1:25 000 First Series’. 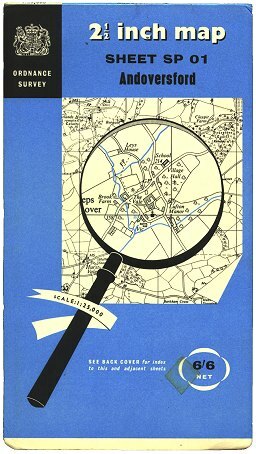 The characteristic ‘magnifying-glass’ cover was replaced by the rather utilitarian ‘house style’ design, incorporating Ordnance Survey’s new logo. This cover was printed on the map sheet itself in such a way that, when folded, the ‘cover’ appeared on the outside (Figure 8). 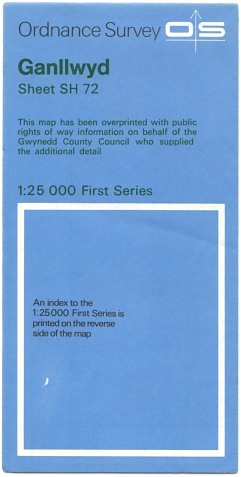 As an interim measure before the publication of the relevant Second Series sheets, fifteen First Series sheets were overprinted with Rights of Way information in 1977 (Figure 9). These sheets covered areas in north-west Wales, Herefordshire and Lancashire. For details of the sheets involved, see the themed collection page. The last batch of three revised reprints of First Series sheets were issued in June 1986: SU 03 Wilton [Wiltshire], TF 14 Heckington and TL 64 Haverhill. The complete replacement of the 1:25 000 First Series came in December 1989 with the publication of the last 1:25 000 Second Series sheet, SX 54/63/64 Newton Ferrers and Thurlestone. The two First Series sheets it replaced had last been revised 30 years previously!